February starts tomorrow and this month's theme for the ornament challenge is "Love". So get your creative juices flowing and let's see some amazing interpretations! My rustic heart was another scrap drawer idea. I pulled out some colored felt, my pinking shears, polyester fill, matching thread and decided to let the sewing machine sit this one out. 1. Draw 5 hearts that decrease in size for your pattern. My largest heart was about 5 inches tall. There needs to be a minimum 3/4" between the sizes. I freehanded my hearts because I wanted them more folk-arty than perfect. Once you have your pattern, cut out two hearts for each sized heart pattern with your pinking sheers. When you are done you will have10 hearts, 2 of each color. 2. Stack the hearts and pin in place. 3. 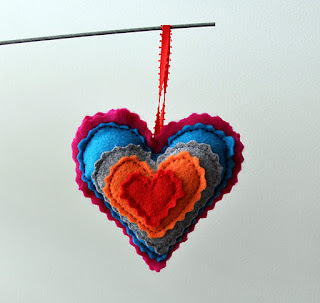 Use alternating thread to attach the hearts to one another to form two sides. 4. Begin sewing the largest hearts together back to back, leaving an opening in order to stuff the heart. 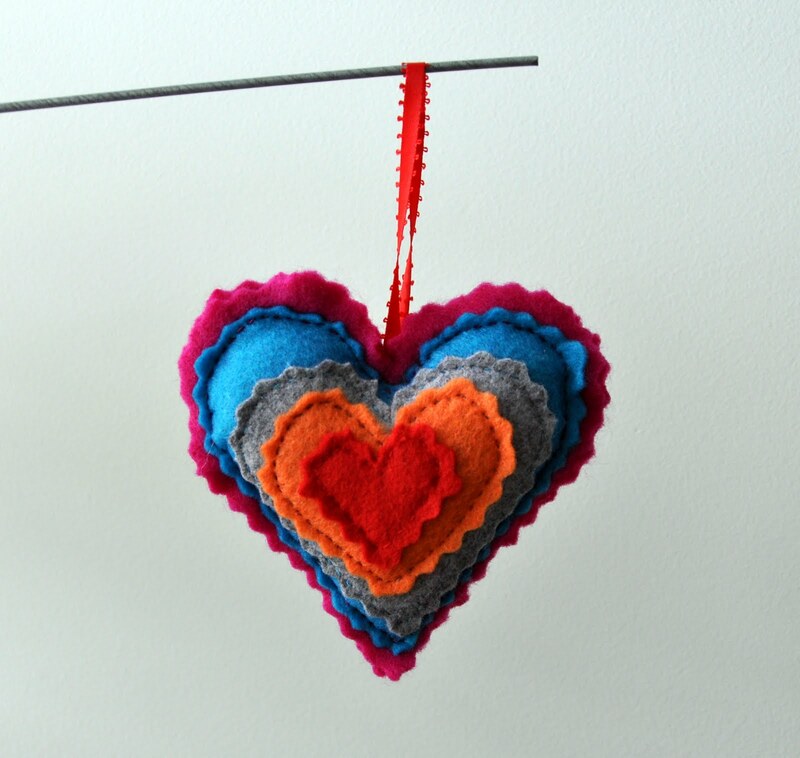 Secure the ribbon hanger with your stitches at the top of the heart. 5. Cut a length of ribbon to use as the hanger, and pin in place between the hearts. 6. Stuff the heart with polyfill, and then complete the stitching to close the heart.